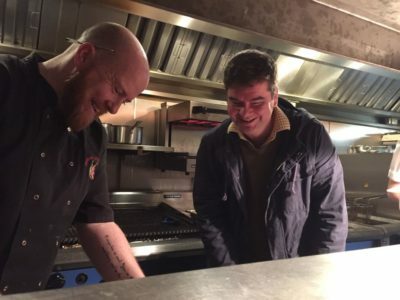 When keen cook Gary Mack saw a competition for a new dish to feature on the menu at his local pub, he immediately saw a fantastic opportunity. A true ‘foodie’, Gary was sorely tempted by the prize on offer – free meals for a month at the Honor Oak in South East London. However, rather than sending in one of his own dishes, Gary had another idea. He decided to put forward a recipe on behalf of GCDA (Greenwich Cooperative Development Agency) the not-for-profit organisation for which he works. This time last year GCDA (which runs a number of social projects in London around food, health and sustainable business), was awarded a grant by Power to Change to develop and sell a range of high quality ready meals that made use of surplus ingredients and helped families facing food insecurity to access nourishing, affordable meals. Alongside, GCDA has implemented a volunteer programme to increase training opportunities for would-be chefs and help improve confidence, food knowledge and recipe development skills. In fact, GCDA has developed two ready meal ranges. The first – a gourmet-style range called PLENTY, uses ingredients from suppliers at a local market and is sold at a premium price. These profits then help fund a second family-friendly range called PLENTY+ which utilises surplus and has proved a real hit at GCDA’s community centre in Woolwich and on kids’ summer food programmes. Cooked in small batches at GCDA’s five-star commercial kitchens the PLENTY range takes inspiration from producers and suppliers at nearby Brockley market. The five dishes feature (amongst other things) free-range meat and homemade sauerkraut. Toby Allen who runs the market, was so impressed with the flavour of the finished recipes, he invited PLENTY to trade on a stall. I loved the idea of customers being able to buy a high-quality convenience food showcasing the produce from the market,” says Toby. “It really celebrates what’s available locally. The fact that GCDA is using the profits from PLENTY to help fund the creation of PLENTY+ makes it unique. The five original dishes Gorgeous Goulash, Luscious Lamb Curry, Trinidad-to-Go-Go, Spanish Soulfood and Pulse-Packed Spanish Soulfood have been flying off the shelves at the PLENTY stall on Saturdays. Gary, who is often to be found serving customers, knew the dishes worked and so he decided to pick one of the most popular, the goulash, and enter it into the Honor Oak’s competition. Imagine his delight when a few weeks later Gary heard that GCDA’s dish had taken the top prize! Gary suggested that if the goulash won then perhaps the Honor Oak might make a contribution to GCDA instead of the usual prize of free meals for a month, so that’s what we’re doing. For every goulash we sell, £1 goes to GCDA to help fund its community work and the pub is matching that too. James has tweaked the original PLENTY goulash recipe to make it his own using slow-braised pork ribeye and crushed potatoes. It’s proving a real hit with customers who’ve declared it the perfect match for the local cask, keg and craft beers that the pub stocks. An all round winner!